This was an impulsive eBay purchase! When I first received it, I wanted to send it back. I think it’s too short. The seller was from Hong Kong and I think the skirt is made to fit shorter people. I like my maxi skirts to be floor grazers. Being from Hong Kong I soon realised it would be impossible to return, so I resigned myself to keeping it. Its growing me, and now I do actually quite like it. 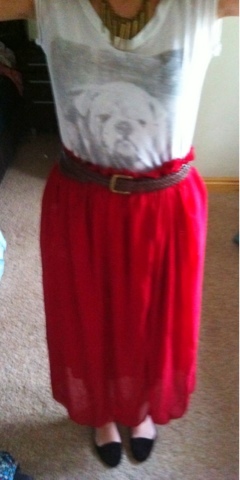 I wore it with flats, a casual tee and my spike necklace to toughen it up a bit and to stop me looking like a granny!